This week’s column is a grab bag, where I look at a number of interesting questions about Genius, sorting albums by an artist’s last name, finding digital booklets in your iTunes library, and more. Q: I use Genius quite often and wonder how it works. Is it similar to Pandora where music is analyzed and matched using computer algorithms, or is it “crowd sourced,” based on matches done by other iTunes Genius users? Also, why is Genius “unavailable” for certain songs? I’m not referring to obscure songs but songs such as “Sympathy for the Devil” and “You Can’t Always Get What You Want” by The Rolling Stones, or “No Sugar Tonight” by The Guess Who. I’ve run into quite a few other songs for which Genius is unavailable in my 7000-plus track library. Essentially, Genius looks at what’s in your iTunes library and compares it with what’s in other iTunes users’ libraries. If you have, say, three songs by Lady Gaga and five by Luciano Pavarotti, and enough other users have the same distribution of songs, then you might see music from those two artists together in a Genius Mix or Genius Playlist. While I find Genius Mixes to be dubious—perhaps my iTunes library is too eclectic—Genius playlists tend to group similar types of music. Genius isn’t always so smart. As to why certain songs don’t show Genius suggestions, I wish I knew. I can confirm that many Rolling Stones songs don’t show Genius suggestions, as well as many well-known songs by the Grateful Dead, Lou Reed, The Cure, and others. Go figure. Q: I downloaded an album from the iTunes Store that came with a digital booklet, but I can’t seem to find it. It’s not showing up with the album. How can I find where this digital booklet went? Digital booklets you get from the iTunes Store are PDF files. They should be in your iTunes library together with the album, but sometimes this isn’t the case. If you can’t find it, you can make a smart playlist that will find all the PDFs in your iTunes library (whether they are digital booklets or books). Use the following condition: Kind is PDF Document. Smart playlists can wrangle all the PDF files in your iTunes library. Q: I’ve got five adult children and we’ve always juggled shared content on my iTunes account, but we are limited to five authorized computers. The kids are now getting married and moving out, but a lot of the music on the ‘family account’ is theirs. Can you suggest a way to work around this limitation without having to repurchase all the music, movies, and apps? Unfortunately, no. As you noted, Apple’s limit is five computers, so there’s no current way you can continue sharing content if your children are going to have enough computers to put you over the limit. Note that the iTunes Store now sells songs without DRM, so any musical purchase you’ve made since January 2009 will work whether or not a computer is authorized. TV shows and movies, however, still carry such restrictions. Q: When I have iTunes in Albums view, albums are sorted by the first name of the artist, such as Bob; and not last, such as Dylan. So albums by Bob Dylan are next to those by Boz Scaggs. Is there any way to sort by last name? 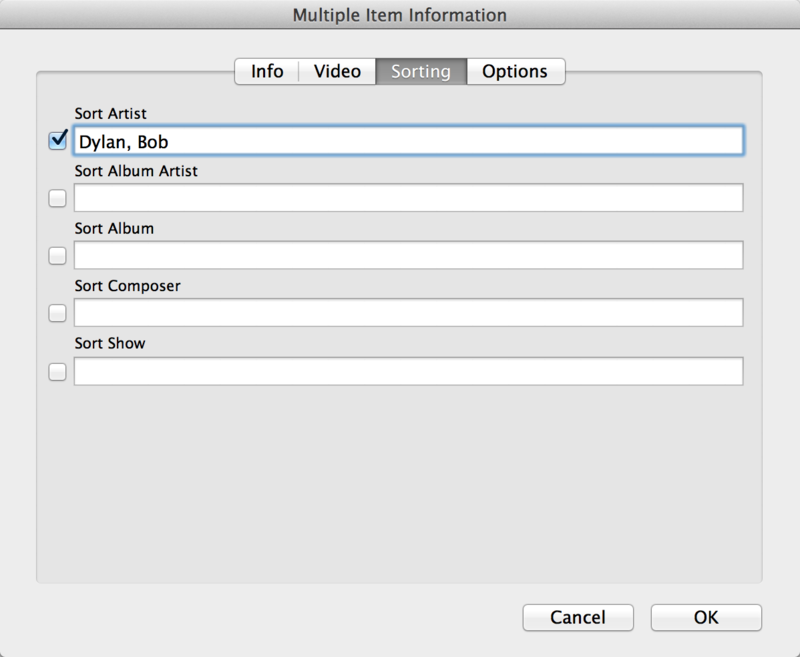 iTunes offers Sorting tags to accomplish what you’re asking. If you select all the items of an album, then click the Sorting tab, you can enter the sort criterion you would like to use. So for your Bob Dylan albums, enter Dylan, Bob in the Sort Artist field. This won’t affect the Artist tag, or the way artists display in Artists view, but it will change the sort order. 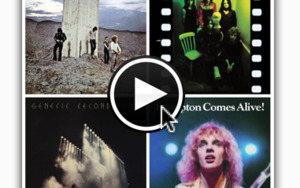 You can trick iTunes into sorting albums by an artist’s last name. Q: Sometimes when sending a song file via email, the album artwork isn’t included within the file itself. 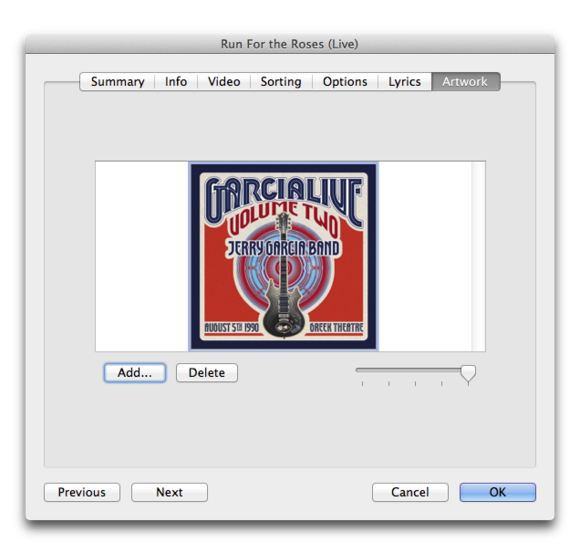 Any idea how to force iTunes to attach artwork to song files? I can’t speak for everything, but if you purchase music from iTunes, album art is not embedded in files. If you want to embed the album art in those files, do the following. Select one file, press Command-I, then click the Artwork tab. Click the artwork to select it, then press Command-C to copy it. Click OK to close the Info window. Now reselect the track, or the album if you have more than one track, then press Command-I. Click the Artwork tab, paste the artwork, then click OK. Note that if it’s a single track, you’ll want to click the existing artwork first, press the Delete key, then paste the copied file to prevent duplicate art in your local file. To embed album art in purchased files, you need to play a bit sneaky.